I am a licensed Doctor of Oriental Medicine (DOM) practicing in Santa Fe, NM, with over nineteen years of in-depth clinical experience and practice that incorporates a broad spectrum of Treatment Modalities. I specialize in pain reduction and support to overcome both emotional and physical traumas, including environmental sensitivities. Come and see me early, and avoid the Flu Season. Also, check out Therapy Treatments with Dolphins and Upcoming Dolphin Programs. So how did I find my way into Body Work and Chinese Medicine? …I was fascinated with studies of Rudolf Steiner at age 18 and realized that I needed a background in mathematics and physics in order to delve deeper. So I completed a Bachelor of Arts in Mathematics and a Master of Science in Chemical Engineering. Following this, I worked in industry for about 18 years; however, the last 6 years of this career, I was quite dissatisfied and had determined to do more with my life, but what? And where? …I was thrown from my horse while jumping and broke my back in two places. After extensive Physical Therapy, I still carried tremendous tension, often going to severe pain in my back and sacrum. I then found my way to several practitioners who had “magical hands” and treated me with Cranial Sacral Therapy and Visceral Manipulation. I was “hooked”. I began taking classes in these modalities and immediately began practicing. I have never looked back. I had the good fortune to be exposed to the use of acupuncture in conjunction with Cranial Sacral work during my early studies and recognized the power in acupuncture and the potential benefits of integrating this work together. My license as a Doctor of Oriental Medicine is in New Mexico. I received a Master of Science in Oriental Medicine from Southwest Acupuncture College. I am also licensed as a Diplomat in Oriental Medicine by the National Certification Commission for Acupuncture and Oriental Medicine (NCCAOM). Additionally, I have over 1900 hours of classroom and clinical studies in Cranial Sacral Therapy, Visceral Manipulation, Biovalent Systems (Frank Lowen), Somato-Emotional Release, Zero-Balancing, Strain-Counter-Strain, Bio-mechanics, Hypnotherapy, Classical Chinese Medicine (Dr. Jeffrey Yuen) with a special focus on Jeffrey’s teachings about ancient Chinese work Using Gems & Stones in Chinese Medicine. I am also a fan of Dr. Richard Tan’s Balance Method and often use it for treating pain. 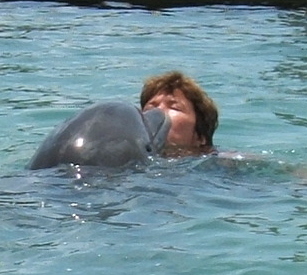 I have been treating people in the water with Dolphins since 1995 in the Florida Keys, Canary Islands, Grand Bahama Island and Roatan, Honduras. See Upcoming Dolphin Programs for some amazing Dolphin opportunities at five-star Anthony’s Key Resort in Roatan. I also worked as a Visiting Therapist for the Upledger Institutes’s Brain and Spinal Cord Dysfunction Center in Palm Beach Gardens, Florida in 1995/1996. I studied extensively with Frank Lowen during a 15 year period, and my work reflects his remarkable contributions. 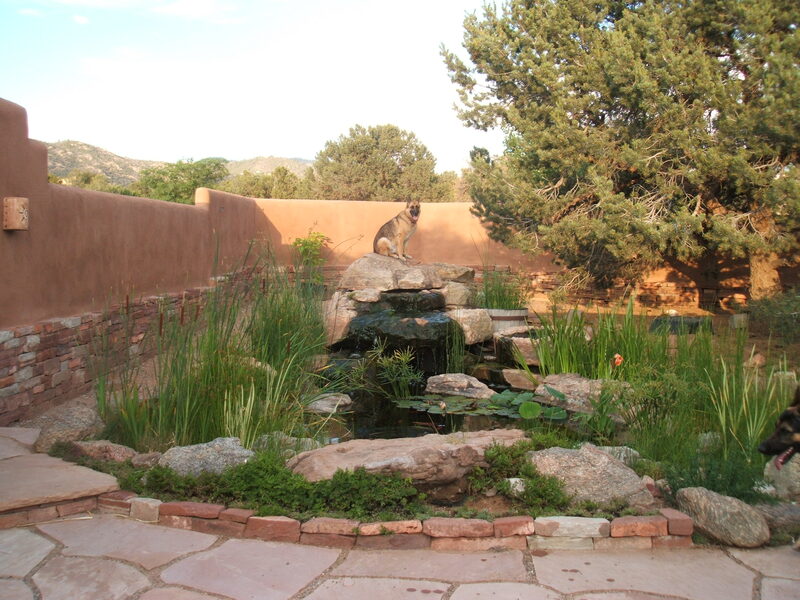 I established a retreat facility in 1995 for studies in Alternative Health at my home in La Honda, CA which successfully operated until I relocated my practice to Santa Fe, NM in 1997. My technical experience in industry includes 13 years as a Program Manager for Lockheed Research and Development where I, along with two colleagues, received the NASA Technical Excellence Award for our contributions to the Space Shuttle for the development of Flight-Readiness Hardware. I co-authored several technical papers, hold 2 patents and 7 invention disclosures, and served 10 years as a member on 2 technical committees for the American Institute of Astronautics and Aeronautics (AIAA). Our technical achievements for Lockheed were publicized in numerous newspapers and technical magazines around the world. Because of my deep concern about the education of our nation’s young people, I originated and co-founded Industry Initiatives for Science and Math Education (IISME) in 1984, which continues as a viable, strong program today in California. IISME received considerable national and international recognition, including recognition from NASA, DOE, and the White House during the 10 years that I actively served on the board as President, Chairperson and Board Member. I am an avid water plant gardener and pond designer. I love my dogs and miss my horses. My clinic is located adjacent to my home which is on 1.5 acres in Santa Fe bordering Arroyo Chamiso at the back of my property. 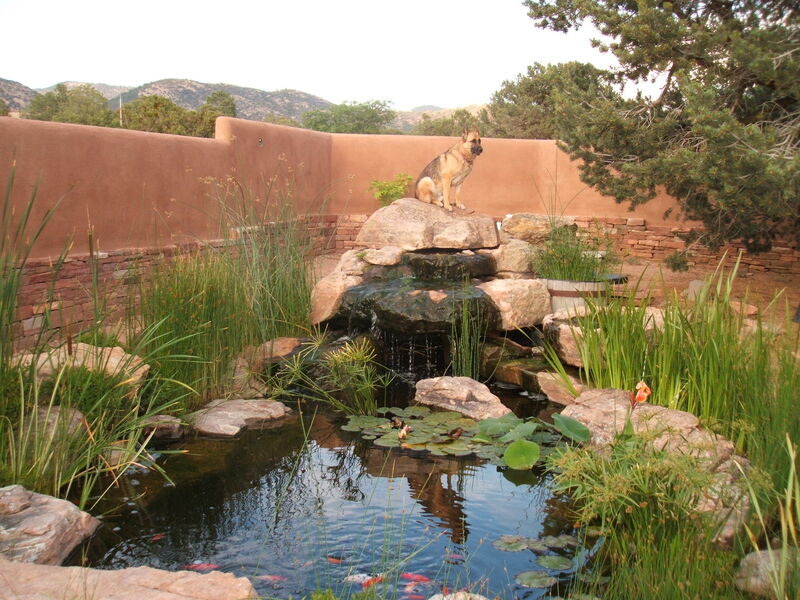 There is a beautiful Koi pond with water falls in the front which is surrounded by an Anasazi dry-stacked stone and stucco courtyard and entrance. I also have a water plant nursery containing multiple plant-growing ponds and a green house filled with tropical plants. There are many varieties of spectactular stones and crystals dispersed throughout my property and also utilized as part of my office and treatment rooms. Visit my Stone Gallery and share this special space. The clinic is within this peaceful setting and is separate from and adjacent to my home. The clinic also has a separate and designated entrance and parking area. Please allow time to enjoy my Stone Gallery, packed with fun and interesting books, articles, crystals and herbs. There is sure to be something there that is special for you. Rebecca has treated me for various chronic health problems over the past few years. Whether you need short term or long term care, I don’t know any other DOM who is better suited and gets more results than she does. My asthma and breathing are much better, and I don’t have to increase my prescriptive drugs. My medical doctors are so impressed with my results that they are also referring their patients to Rebecca. Believe me, this is the DOM you want to have treat you!